Summers are in full swing and its scorching hot here in Bangalore. Yesterday evening, there was a drizzle of rain which made me so happy 😀. Today, I will be reviewing a face mask that is apt for summers. 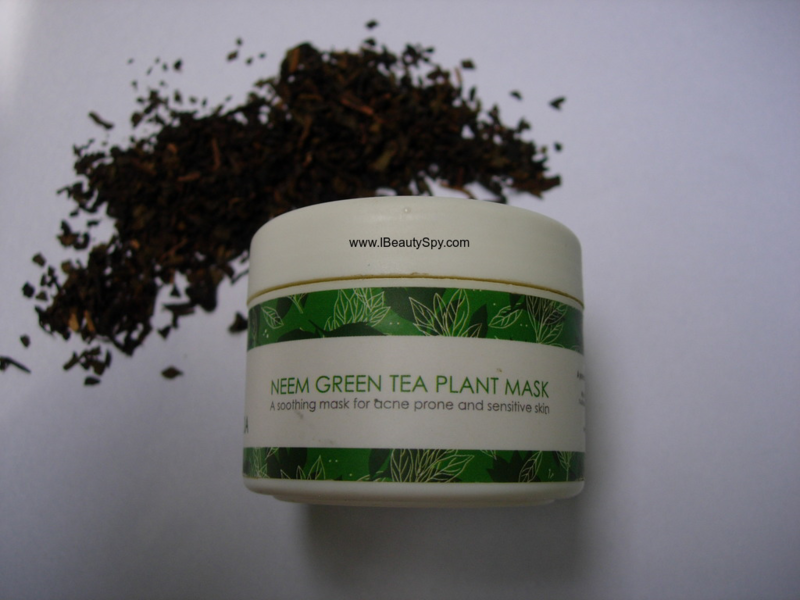 I received this Suganda Neem Greeen Tea Plant Mask in one of My Envy Box. It seemed like a new brand and I didn’t have much expectations from it. On the contrary, it turned out to be one of the best masks I have used, especially for oiliness and acne. 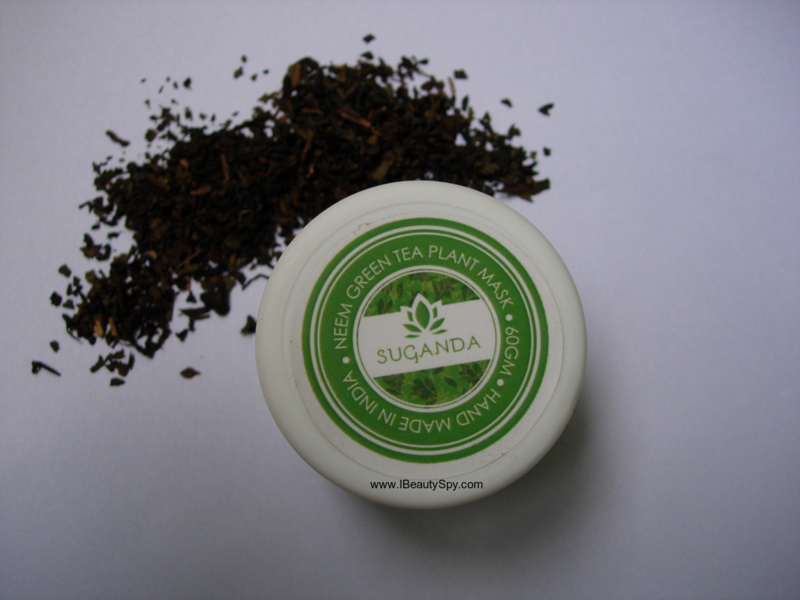 Read on to know how Suganda Neem Green Tea Plant Mask works. A soothing mask for acne prone and sensitive skin. 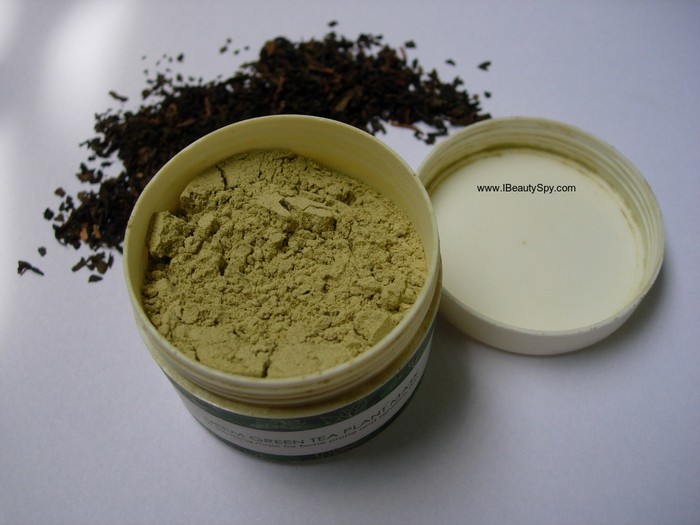 Suganda Neem Green Tea Plant Mask comes in a powder form. The powder is not very fine and slightly granular in texture. You can make out the green tea leaves in it. It is brownish green in color. The fragrance of Suganda Neem Green Tea Plant Mask is amazing. Imagine walking in a garden of neem trees and tea plants. So refreshing, so soothing and calming to the senses. I like to mix the powder with curd and apply it on my face. If you mix it with water, you may face some difficulty in spreading evenly on face. Also with water, the mask dries out very soon. With curd, you can keep the mask on for a longer time. While washing off, you can scrub it around a little to exfoliate and remove dead skin cells. I had some acne and breakouts on my face due to summers. When I used this mask, I could immediately see the breakout subduing in one use itself. After 3 uses, the pimple had completely disappeared without leaving any scars. I am completely hooked onto this product for this reason. 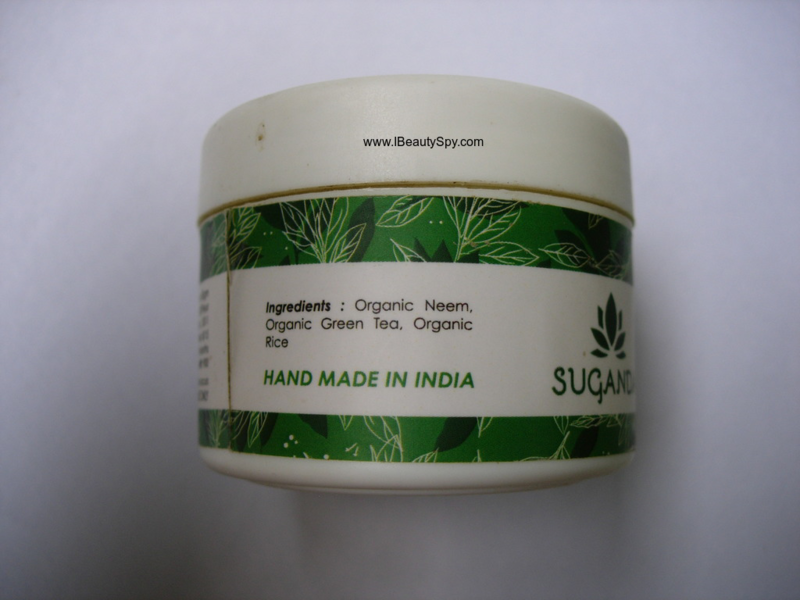 Suganda Neem Green Tea Plant Mask also purifies skin and clears clogged pores. It gives a cooling sensation. Face feels instantly refreshed and some tan is also removed due to the presence of rice powder. It also tightens and firms skin and controls oiliness. Suganda Neem Green Tea Plant Mask doesn’t cause any tingling sensation unlike other face masks. It is very gentle on the skin, so even sensitive skin people can use it. The only con is the price. But it contains all organic and pure ingredients. And its handmade as well. Of course, you can make this easily at home, since it contains only 3 ingredients. But if you don’t have neem leaves in your house like me or staying in a PG like me, this is a great option. One tub of this lasted me for around 15 uses. And well, if you need more convincing, I would say when everyone is going gaga over the TBS face masks which are exorbitantly priced at >Rs.2400, I would say this is far cheaper and more effective than that. * Subdues and heals acne in 3-4 uses. * Purifies skin and clears clogged pores. * Tightens and firms skin. * Controls oiliness and cools skin. * Refreshing and soothing fragrance of natural ingredients. * Organic and pure ingredients. * Not available on shopping sites. Yes, definitely, for acne prone, oily and sensitive skin. A nice product for summers. Yes, definitely. Just for the refreshing natural fragrance which makes me feel am walking in a garden of neem trees and tea plants. Its slightly expensive. But considering its effectiveness, I would say its worth the money. Availability: You can buy online from their website here. 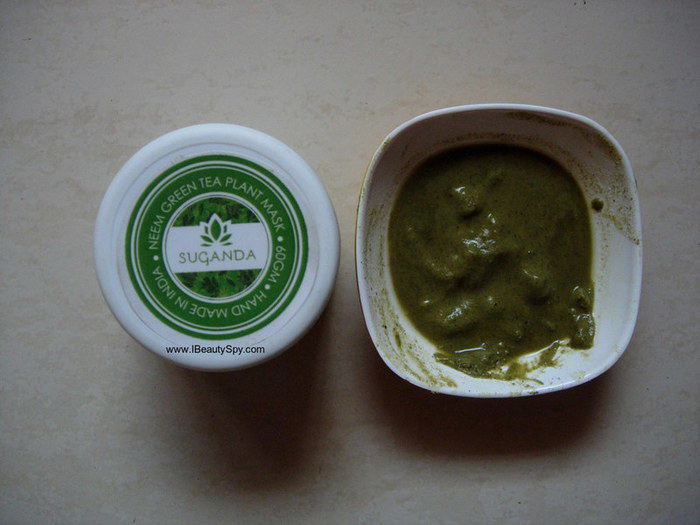 I am head over heels in love with the Suganda Neem Green Tea Plant Mask. I have tried so many face packs, but this has become one of my favorites due to its effectiveness in healing acne. If you are a natural products lover like me and looking for a good detox mask to purify your skin this summer, you would definitely love this. I only wish this was more widely available in online shopping sites. Thank you for reviewing this product. I have problems with oily skin and tried so many products. The thing I like the most about it are the organic and natural ingredients since I’m sensitive to chemicals. Must try it.